These garlic mashed potatoes are made with red-skinned potatoes. Feel free to add a little fresh chopped parsley and chives to the potatoes when you mash them. 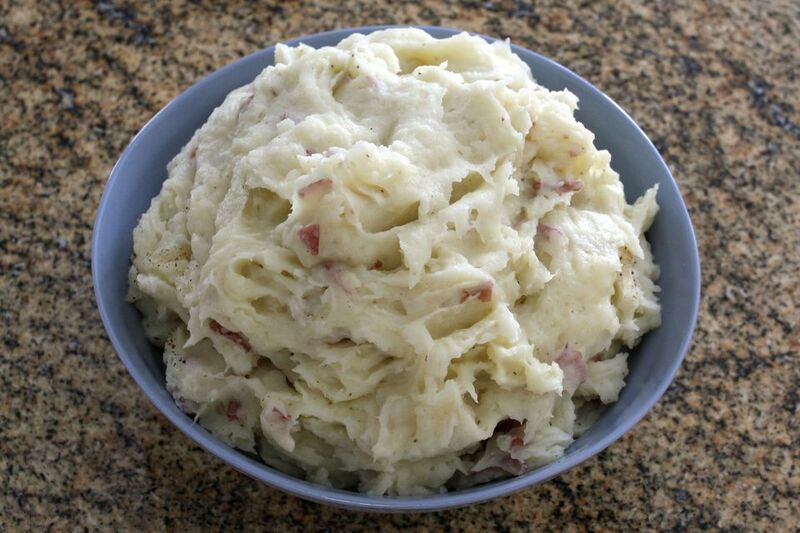 The mashed potatoes gain color with unpeeled red potatoes, but you may peel the potatoes if you prefer, or use another variety of potato. Yukon Gold potatoes or baking potatoes may also be used for this recipe. You can also use olive oil instead of butter in the recipe. See the tips and variations for more flavor alternatives. Scrub potatoes and cut into small chunks. Put potatoes and the sliced garlic in a medium saucepan; cover with water and add salt. Bring to a boil; cover, reduce heat to medium-low and continue cooking until the potatoes are tender, about 20 minutes. Put 1/2 cup of milk or half-and-half in a saucepan and heat just until hot. Remove the potatoes from the heat and drain well. Pour them into a bowl and mash with the butter and hot cup milk or half-and-half. Garnish the potatoes with fresh chopped parsley or chives, if desired. Cheddar and Onion Mashed Potatoes - Omit the garlic, if desired, and add 3/4 to 1 cup of shredded cheddar cheese and 1/4 cup of finely chopped green onion tops before mashing. Gruyere and Garlic Mashed Potatoes - Add 1 cup of shredded Gruyere cheese along with the hot milk; mash and proceed with the recipe. Garlic and Pesto Potatoes - Omit the butter and add 1/4 cup of prepared pesto and 3 tablespoons of fresh grated Parmesan cheese along with the hot milk. Mash and proceed with the recipe. Lighter Alternatives - Cut back on the butter or use extra virgin olive oil instead of butter. Use half milk and half chicken broth instead of all milk or half-and-half. Garlic and Sour Cream Mashed Potatoes - Instead of hot milk, add sour cream or part sour cream (preferably at room temperature) to the potatoes before mashing. Add a tablespoon or two of chopped chives or 2 teaspoons of dried dill weed, if desired.